An erstwhile Dresden Doll and current half of Evelyn Evelyn, Amanda Palmer is the uncrowned queen of using music to reside in constructed realities and the bodies and minds of intriguing characters. Her latest subject—Radiohead and their lead singer Thom Yorke—feels more false and flimsy than any before, and on an EP covering the band, that feeling isn’t just because of her self-imposed challenge to focus on the ukelele. Granted, that instrument is always going to carry a stigma of chintz and kitsch, the legacy of Tiny Tim beating out the efforts of Hawaii’s best musicians. Applying that sound to the desperation in Yorke’s lyrics imbues them with an unseemly Richard Cheese quality, especially evident in the two (!) screechy live versions of “Creep” found on Amanda Palmer Performs the Popular Hits of Radiohead on Her Magical Ukulele. It also suggests the real problem with the EP is a sense of self-indulgence replacing the theatrics of her prior work. Palmer creates entire mythologies—her songs are about something or someone, no matter how metaphorical the set scene—while Yorke’s strength is dropping momentous bombs of imagery which suggest something else. Her spare takes of Radiohead favorites like “Fake Plastic Trees” and “No Surprises” are little more than gothic karaoke, trading Yorke’s mushmouthed gravitas for an unsteady tenor version more like Marianne Faithfull. The ukelele is fragile and delicate by nature so it certainly needs some help, and string, voice, and piano overdubs do give “No Surprises” a little depth. Yet if you’re putting the thing in the title of your release you better be prepared to go all the way. Palmer confuses the issue with a version of “Idioteque” that’s the EP’s fullest and most exciting recording yet limits the uke to a few notes frenetically hit over and over; “Exit Music (for a Film),” meanwhile, doesn’t seem to have any ukelele at all. Credit Amanda Palmer for never being afraid to try and fail, and credit her further for not really failing throughout her career to this point. 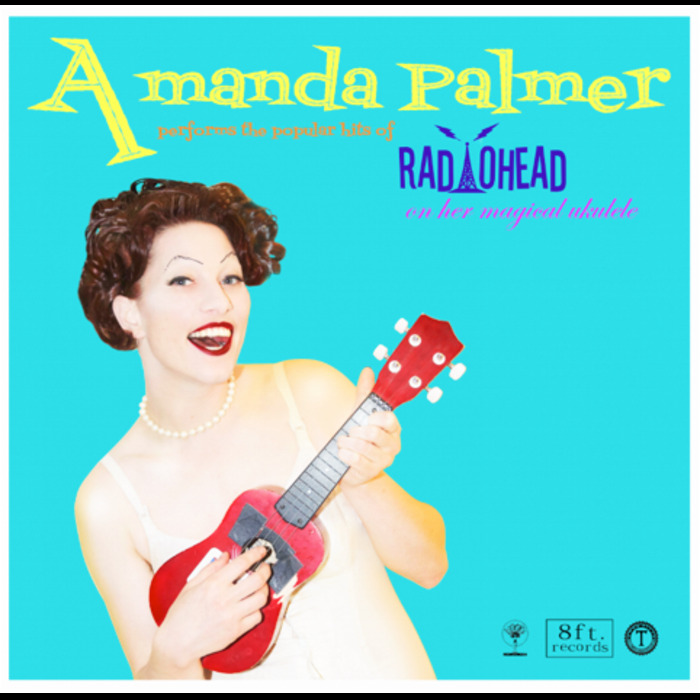 Amanda Palmer Performs the Popular Hits of Radiohead on Her Magical Ukulele, however, collects for posterity her first serious musical mistakes.